In a continued effort to keep our readers informed of the most current construction cost trends on projects that EVstudio has experience in, below is the 2013 cost data from RSMeans, the industry leader in construction cost estimating. These costs are for the completed, finished building project and does not include land costs, entitlements costs, soft costs, financing costs, other site improvement costs or furnishings, trade fixtures or tenant equipment. 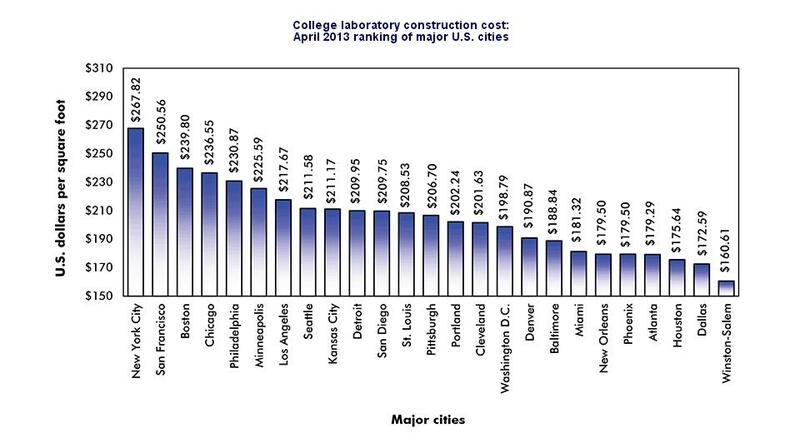 This data is for College Laboratories. If you would like to discuss a Education type project with our design team, we would be happy to help you with your next steps. Thanks for your question. In general, I’d be inclined to believe that you’re looking at similar costs for the college labs and research institute lab facility. Perhaps a slight reduction if you don’t have BSL ratings or wet space. Please bear in mind, these are 2013 numbers, so you would want to index them based on inflation to get a 2017 budget. I hope that helps. 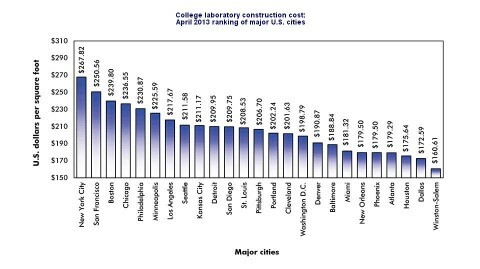 Since your numbers are for college laboratory construction costs, are you able to provide similar cost per square foot for a Basic/Applied Sciences Research Institute laboratory facility? We are looking at San Diego and Houston, so not asking for an exhaustive list…only these two markets. Also, the labs within the institute will only be Physical Sciences – thus, no BSL ratings, no wet space: Physics, Chemistry, Math, Computer Science, Engineering, Space Sciences, Communications… We are looking at construction of two buildings (side-by-side), on the order of 350,000 sq ft. There may be clean rooms, in addition to bench space labs, but only for clean assembly. Thank you for your inquiry. While our data in this blog post does not extend beyond the United States, we would be happy to work with you on your project. In order to properly prepare a price for your project, we would need to do some preliminary programming. This is an important part of the planning process. There are a number of ways that we can engage in that process with you, so if you were interested, please give us a call at 303-670-7242 and we can take the next steps together. Thank you again and we look forward to hearing from you!